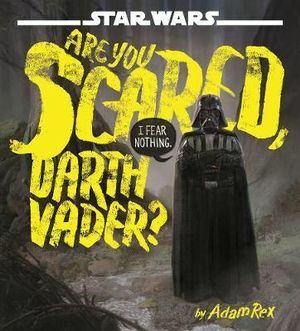 Kids' Book Review: Review: Are You Scared, Darth Vader? Review: Are You Scared, Darth Vader? Are You Scared, Darth Vader? by Adam Rex is a laugh out loud story for children (adults too) about fear and one of today's most iconic villains, Darth Vader. As one of the ultimate movie baddies, Darth Vader is someone that children might be fearful of. But as a villain he shouldn't be scared of anything, right? In this unique story we will discover what Darth Vader is not scared of but also what he is terrified about. Readers will discover more about Darth Vader's character though his serious and unemotional comments. The other characters in the book are children in masks. They are trying to scare Darth Vader with their disguises of a wolfman, vampire, witch and many more scary things. These things are often at the centre of common childhood fears. IS THIS THE GHOST OF OBI-WAN KENOBI? OR YODA? IT IS SHORT LIKE YODA. I think it's just a ghost. I wonder what will scare Darth Vader so much that it will have him quivering in his suit? On the surface Are You Scared, Darth Vader? looks like a story based around Darth Vader and Star Wars. But Rex has written a story that explores common childhood fears in a humours way. The illustrations are dark with children dressed in Halloween costumes. The lightness and humour in this story are created though the text, the characters and pops of bright florescent sunshine yellow. Rex presents a role reversal in the story by giving the children the power to frighten a villain. Adam Rex has previously written about fear and anxiety in his book School's First Day of School. Finally, while many children are not old enough to have watched the Star Wars movies, there are many chapter books, information books, toys and even a board book that inform children about this franchise. This prior knowledge will help them understand the Star Wars character references within this book, without having watched a single movie. See below for more books about Star Wars. Star Wars Block, Star Wars: The Force Awaken, Star Wars Galactic Atlas, Star Wars: The Last Jedi: The Visual Dictionary and Star Wars: The Original Trilogy: A Graphic Novel. Title: Are You Scared Darth Vader?